Thursday, October 11 thru Saturday, October 27, 2018. Have you ever sat around a campfire and shared SPOOKY stories – maybe at a slumber party, or at a family campout, or at summer camp…? 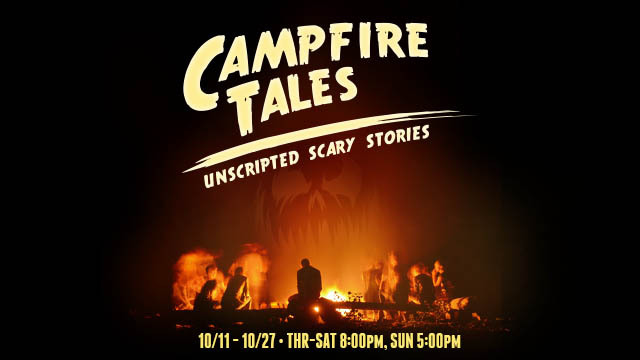 Gather around the campfire with Modjeska Unscripted Theater as they spin yarns of legendary creatures, psychological thrillers, and ghosts all on the spot and completely improvised. Each night the cast of Unscripted Actors will create multiple family-friendly short plays ranging from spooky to kooky that are sure to put you in the Halloween spirit. Based on audience suggestions, no night or story will ever be the same and nobody will know what shadows are lurking behind the trees until they materialize! Promo Code: “SPOOKY“ for an $8 discount per ticket!